Cumrun Vafa was born in Tehran, Iran in 1960. In 1977, he came to the United States to study at Massachusetts Institute of Technology (MIT), where he received a B.S. degree in physics and mathematics in 1981. 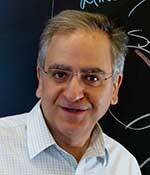 He obtained his Ph.D. in physics from Princeton University in 1985 under the direction of Edward Witten. Later in 1985, he became a Junior Fellow at the Harvard Society of Fellows. He was appointed as a full professor in the Department of Physics at Harvard University in 1990 where he is currently the Donner Professor of Science. Vafa`s main work is focused on string theory including applications to quantum field theory and quantum gravity. He is the founder of `F-theory` which is one of the most promising directions in connecting string theory to particle physics. He has used the geometry of internal dimensions of string theory to construct novel physical theories known as `geometric engineering of QFT`s`. His contributions in this context involve elucidation of topological string theory including discovery of mirror symmetry between Calabi-Yau manifolds, its applications to holography and entropy of black holes, as well as to knot theory and enumerative geometry. He is a member of the National Academy of Sciences and has been awarded the Dirac Medal of ICTP and the AMS Leonard Eisenbud Prize for Math and Physics as well as the Physics Frontiers Prize from the Breakthrough Prize Foundation.